Helping Save The Heroes Since 1989! As the name implies, first responders are those people that are first on the scene. Whether it is a natural or man-made catastrophic event or act of violence, this can include firefighters, law enforcement officers, emergency medical personnel, dispatchers, members of the military (active, reserve, and veterans), school teachers, airline personnel, and any other citizen that may be affected by a catastrophic event or act of violence. First responders answer the call every day responding to many different types of critical incidents including robberies, motor vehicle accidents, emergency medical responses, domestic assaults, school shootings, hostage situations, fires, and other violence. Being repeatedly exposed to these types of incidents can elicit stress responses and symptoms. A critical incident can be defined as “any event that has a stressful impact sufficient enough to overwhelm the usually effective coping skills of an individual”. Critical incidents are abrupt, powerful events that fall outside the range of ordinary human experiences. These events can have a strong emotional impact, even on the most experienced first responder or citizen. ICISF is celebrating its 30th anniversary of helping to support those people exposed to disasters and crises while providing service to their communities as first responders, educators, healthcare providers, military, spiritual care providers, as well as many other helping professions. 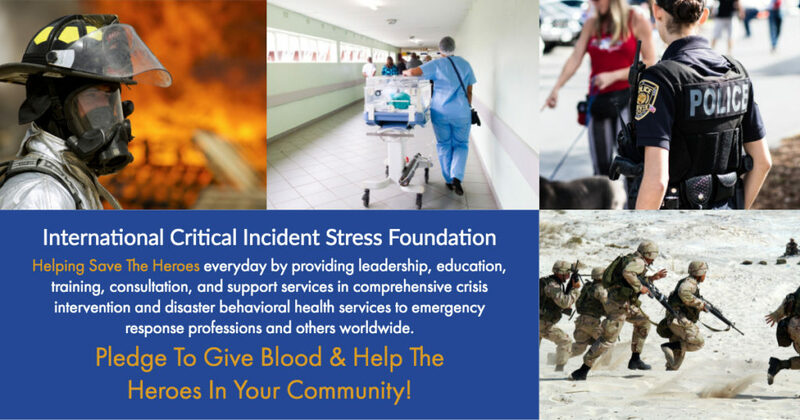 Join ICISF and pledge to give blood and support the first responders in your community.